Composer, arranger and pianist Ted Howe is a native of Boston, Massachusetts, a graduate of the Berklee School of Music (where he also taught) and has recorded 3 small group CDs for Summit Records. 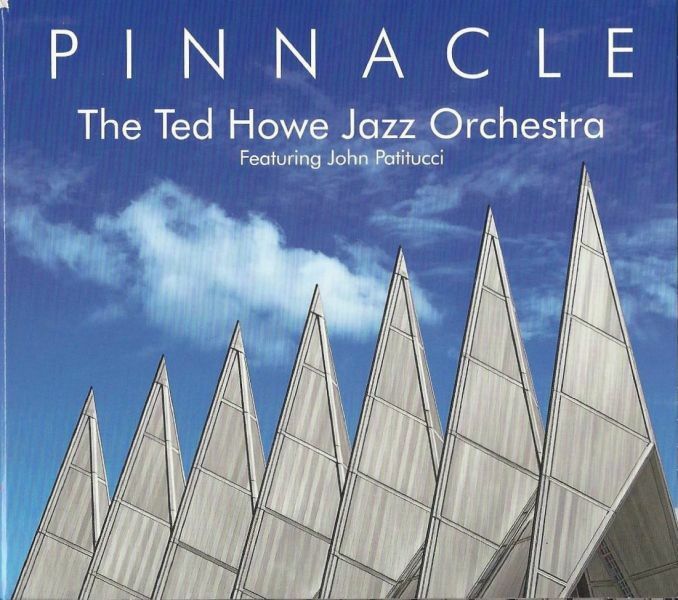 "Pinnacle" (Hot Shoe Records) is the recorded debut of the Ted Howe Jazz Orchestra. The 16-piece ensemble mainly features musicians from the Atlanta with the exception of bassist John Patitucci (who has worked with Howe in the past) and LA-based trombonist Andy Martin. The program is divided into 4 pieces written between 2011-12 and the 3-part "Suite #1 for Jazz Orchestra", a work that Howe began working on in 1980 within former teacher Herb Pomeroy. The 18-minute "Suite.." takes up over 1/3rd of the album and is an exercise in multiple tempos, sound manipulation and a variety of textures from the majority of the musicians (for instance, alto saxophonist Sam Skelton also doubles soprano sax, flute and clarinet while Geoff Haydon plays both acoustic piano and Rhodes). What stands about this work (and, for that fact, the rest of the recording) is how Howe concentrates on melody, harmony and the blending of textures and not so much on spotlighting soloists. There is a "pop" sensibility to sections of the melody in all 3 parts as well as how drummer Marlon Patton not only drives the band but also frames the pieces. Having Patitucci and his thick electric bass tones securing the "bottom" is another plus. While all the songs have names usually reserved for classical pieces, there is no doubt this is a jazz album. After a solemn rubato opening to "Presto for Two Trombones", the rhythm section kicks into high gear and the reeds share the melody with trombonists Martin and Francisco Torres. "Impromptu for Trumpet" opens with the composer on piano then moves into a dialogue with the trumpet of Lester Walker. Soon, the rest of the Orchestra enters and the ballad moves in a Brazilian direction. As the trumpeter's solo builds in intensity, his cohorts move with him. Howe takes the lead again on "Adagio For Piano"; while he is the only soloist (and he shines in this spotlight) on the track, the writing for the various sections is colorful, used to move the piece forward. Kudos to the excellent work on acoustic guitar by Dan Baraszu. The program closes with the funky and forceful "Etude for Three Clarinets". Patitucci and Patton really ignite the piece and the clarinet work of Skelton, Don Erdman and and Seth Kuehn (on bass clarinet) is engaging. "Pinnacle" is dedicated to Herb Pomeroy and inspired by the multi-faceted career of Duke Ellington. The music is lively and smart, the musicians engaged and focussed; what the project is not is an imitation of the Ellington oeuvre. Ted Howe waited a long time to document this music and the results are charming. For more information, go to www.hotshoesrecords.com. For "The Left Side of the Moon" (self-released), her 3rd CD as a leader, pianist/composer Chantale Gagné not only returns to the tried-and-true rhythm section of her previous releases - Peter Washington (drums) and Lewis Nash (drums) - but also adds the evocative sounds of Steve Wilson (soprano and alto saxophones, flute). It's been 4 years since her sparkling "Wisdom Of The Water" CD; listening to the new disk alongside the older one shows that, if anything, Ms. Gagné has matured even more as a composer and as a musician. She has such a lovely touch on ballads such as the title song (which features the lovely soprano sax work of Wilson) yet is not afraid to let the music go in unexpected directions. Halfway through the piece, the tempo doubles, the intensity increase and the rhythm section drives the piece forward. There is a stateliness to the melody of "A la claire Fontaine" (a duo for soprano and piano) but, once into her solo, the pianist takes a rhythmic approach to her playing, setting the stage for a saxophone solo that soars over her powerful chords. Wilson's flute adds another sonic dimension to "Up Again", a touch of blues and longing. The piano solo is deliberate over the counterpoint of the bass and dancing brush work. The uptempo pieces have a power in both the rhythm and the melody lines. "Mystère" opens the program and is the only trio piece yet it still sets the scene for what follows. Dramatic piano chords are all one hears until Washington and Nash come in setting a driving beat. But Ms. Gagné soon changes the intensity and song ebbs and flows forward. "Your Blues is My Blues" is just that, a joyful blues romp with delightful drums and walking bass laying the foundation for the pianist and alto saxophonist to swing their souls. Another "danceable" work is "Just a Dream", this time a seductive tango, with Nash leading the band through its paces. There is also a Latin feel to "Moon Gazing" (plus a glorious moment of "swing" now and then) with Wilson's soprano swooping and diving over the responsive rhythm section. One hears traces of earlier jazz styles (50s and 60s) on "Echoes", another vehicle for the vivid soprano sounds plus an expansive piano solo. "The Left Side of the Moon" comes to a close with the short (95 seconds) unaccompanied piano piece, "Roach Rag." It's a light-hearted sendoff to an album that is the most emotionally rich recording that Chantale Gagné has made thus far in her relatively short career. She has built such a strong musical relationship with Peter Washington and Lewis Nash; there are several moments when it seems the 3 breathe together. Adding Steve Wilson to the mix provided the composer several new sounds to work with and the results are splendid indeed. For more information, go to www.chantalgagne.com. Here's a delightful idea. Conceived in living rooms and small performance spaces, the Susan Krebs Chamber Band makes intimate jazz that swings, sways, soars but never roars. "Simple Gifts" (GreenGig Music) finds Ms. Krebs voice in collaboration with piano (Rich Eames), violin/viola (Paul Cartwright), percussion (Scott Breadman) and the many reeds of Rob Lockart (tenor and soprano saxophones, bass clarinet, flute). The program starts with the easy loping beat of "Let's Call a Heart a Heart"; the rich vocal gets great support from the bluesy piano, swooping violin, the tenor and bass clarinet and the percussion. Breadman makes the most of his small trap set (cajon, hand percussion and cymbals), propelling the band forward with ease and pizazz. The melody and arrangement of Jimmy Rowles' "Looking Back" may remind some of the sound Sting created for his song "Russians" (but without the angst of Brecht/Weill that one hears in the later piece.) Cartwright strums his violin to set the rhythm on Sergio Mendes's "So Many Stars", working in tandem with the piano and percussion while the soprano dances around the voice. A gypsy feel permeates the band's interpretation of Abbey Lincoln's "Throw It Away", with Cartwright's rich violin lines flying above the growling bass clarinet and dancing rhythms of percussion and piano. Eames take a dazzling solo on "For All We Know" while Ms. Krebs delivers a dramatic vocal. At times, there is a theatrical nature to her approach to the lyrics; that works very well on pieces like "For All We Know" and "Once Upon A Summertime." The violin also has that quality on the pieces so the sounds match well. The CD close with the title track, the Shaker traditional that Aaron Copland used to such great effect in "Appalachian Spring." This version has the feel of a Bruce Hornsby song, most noticeable in the saxophone and piano. Lockart's vibrant solo reverberates in a similar fashion to what Jan Garbarek created in "Witchi-Tai-To" in 1970. Again, Breadman's work is exemplary as he not only sets the pace but knows how to push the soloist. "Simple Gifts" is intimate yet expansive, playful yet emotionally strong, music to lift your spirits. Through this music, one can hear how much fun The Susan Krebs Chamber Band has when they work together. And it's contagious. For more information, go to www.susankrebsmusic.com.